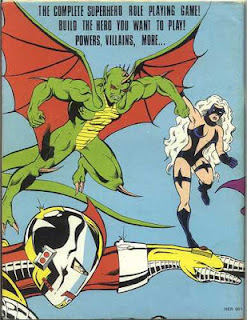 Advanced Dungeons and Parenting: A Look Back at CHAMPIONS 1st Edition. A Look Back at CHAMPIONS 1st Edition. With the recent announcement that Ron Edwards was teaming up with Hero Games to produce CHAMPIONS NOW, a game that hearkens back to the first three editions of the game, I thought it would be a good time to take a look at those older editions. The CHAMPIONS super hero role playing game is one of the best super hero role playing games ever designed, and the game to which all super hero rpgs are compared. 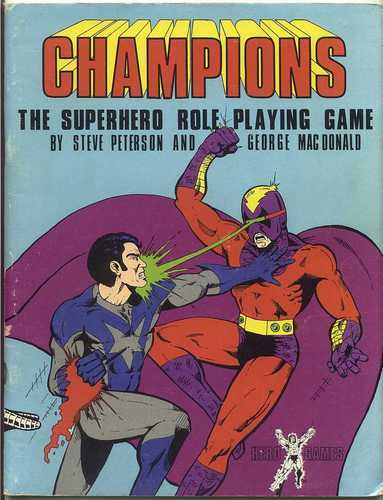 CHAMPIONS wasn't the first role playing game in the super hero genre, that honor goes to the game SUPERHERO 2044 which I discussed in an earlier blog post. CHAMPIONS even builds upon some of the ideas in SUPERHERO 2044. CHAMPIONS used the vague point based character generation system of SUPERHERO 2044 -- combined with house rules by Wayne Shaw that were published in issue 8 of the Lords of Chaos Fanzine-- as a jumping off point for a new detailed and easy to understand point based system. CHAMPIONS was also likely influenced by the melee combat system in SUPERHERO 2044 in the use of the 3d6 bell curve to determine "to-hit" rolls in combat. While CHAMPIONS wasn't the first super hero rpg, it was the first that presented a coherent system that allowed a player to design the superheroes they read about in comic books. The first edition of VILLAINS & VIGILANTES, which predates CHAMPIONS, did a good job of emulating many aspects of comic book action but the ability to model a character in character design wasn't one of them. CHAMPIONS was released at the Origins convention in the summer of 1981, and it immediately captured the interest of Aaron Allston of Steve Jackson Games. Allston gave CHAMPIONS a positive review in issue #43 of the Space Gamer magazine, wrote many CHAMPIONS articles for that publication, and became one of the major contributors to the early days of CHAMPIONS lore. Reading through the first edition of the game, can have that kind of effect upon a person. The writing is clear -- if uneven in places -- and the rules mechanics inspire a desire to play around in the sandbox provided by the rules. George MacDonald and Steve Peterson did more than create a great role playing game when they created CHAMPIONS, they created a great character generation game as well. Hours can be taken up just playing around with character concepts and seeing how they look in the CHAMPIONS system. There are sites galore about CHAMPIONS and many reviews about how great the game is, and it truly is, so the remainder of the post won't be either of these. Rather, I would like to point out some interesting tidbits about the first edition of the game. Most of these will be critical in nature, but not all. Before going further I will say that though CHAMPIONS is now in its 6th edition and is a very different game today in some ways, the 1st edition of the game is highly playable and well worth exploring and I'm glad that Ron Edwards has picked up that torch with CHAMPIONS NOW. One of the first things that struck me reading the book was how obviously playtested the character design system was. This is best illustrated in the section under basic characteristics. In CHAMPIONS there are primary and secondary characteristics. The primary characteristics include things like Strength and Dexterity. The secondary statistics are all based on fractions of the primary statistics and represent things like the ability to resist damage. Where the playtesting shows here is in how players may buy down all of their primary statistics, but only one of their secondary statistics. A quick analysis of the secondary statistics demonstrates that if this were not the case a "buy strength then buy down all the secondary stats related to strength" infinite loop would occur. It's striking how few skills there are in 1st edition CHAMPIONS. There are 14 in total, and some of them are things like Luck and Lack of Weakness. There are no "profession" skills in 1st edition. To be honest, I kind of like the lack of profession skills. Professions in superhero adventures seem more flavor than something one should have to pay points for, but this is something that will change in future editions. There are a lot of powers in CHAMPIONS, but the examples are filled with phrases like "a character" or "a villain" instead of an evocative hero/villain name. It would have been more engaging for the folks at Hero Games to create some Iconic characters that are used throughout the book as examples of each power. The game does include 3 examples of character generation (Crusader, Ogre, and Starburst), but these characters aren't mentioned in the Powers section. An example using Starburst in the Energy Blast power would have been nice. The art inside the book is less than ideal. Mark "the hack" Williams has been the target of some criticism for his illustrations, but his work is the best of what is offered in the 1st edition book. It is clear why they decided to use his work in the 2nd edition of the game. Williams art is evocative and fun -- if not perfect -- while the work Vic Dal Chele and Diana Navarro is more amateurish. The game provides three examples of character generation, but the designs given are less than point efficient and one outclasses the others. The three sample characters are built on 200 points. Crusader can barely hurt Ogre if he decides to punch him (his punch is only 6 dice), and his Dex is bought at one point below where he would receive a rounding benefit. Ogre has a Physical Defense of 23. This is the amount of damage he subtracts from each physical attack that hits and it is very high. Assuming an average of 3.5 points of damage per die, Ogre can resist an average of 6.5 dice of damage per attack. Yes, that's an average but the most damage 6 dice could do to him would be 13. That would be fine, except Crusader has that 6d6 punch, and Starburst...oh, Starburst. All of Starburst's major powers are in a multipower which means that as he uses one power he can use less of the other powers in the multipower. The most damage he can do is 8d6, but only if he isn't flying and doesn't have his forcefield up. Not efficient at all. One might hope that character examples demonstrate the appropriate ranges of damage and defense, these don't quite achieve that goal. The combat example is good, if implausible. Crusader and Starburst defeating Ogre? Sure. The supervillain stats at the end of the book -- there are stats for 8 villains and 2 agents -- lack any accompanying art. The only exception is Shrinker. Speaking of artwork and iconics. Take that cover. Who are these people?! I want to know. The only one who is mentioned in the book is Gargoyle. It's pretty clear which character he is, but I only know his name because of a copyright notice. Who are the other characters? Is that "Flare"? The villain is named Holocaust, but that cannot be discerned from reading this rule book. If you know, please let me know. I'd love to see the stats for that guy punching "Holocaust" with his energy fist. CHAMPIONS is a great game, and the first edition is a joy. If you can, try to hunt down a copy and play some old school super hero rpg. This is an update of a post from 2012.